Front row (left to right): 1. unidentified, 2. unidentified, 3. unidentified, 4. unidentified, 5. unidentified, 6. unidentified, 7. unidentified, 8. unidentified. Second row: 1. unidentified, 2. unidentified, 3. unidentified, 4. unidentified, 5. unidentified, 6. unidentified, 7. unidentified, 8. unidentified. Third row: 1. unidentified, 2. unidentified, 3. unidentified, 4. unidentified, 5. unidentified, 6. unidentified, 7. unidentified, 8. unidentified. Credits: Bill Elliott's Studio, 1065 First Street, Livermore, CA. From the collection of Brian McFann. Please help identify the teacher, grade, and school year so that this picture can be properly filed in the archive. This picture was part of a set purchased on ebay from someone who did not know the original owner and did not have any information about the pictures. I am only guessing that this is the school year 1953-1954 because the background matches two other pictures taken at Junction for that year. 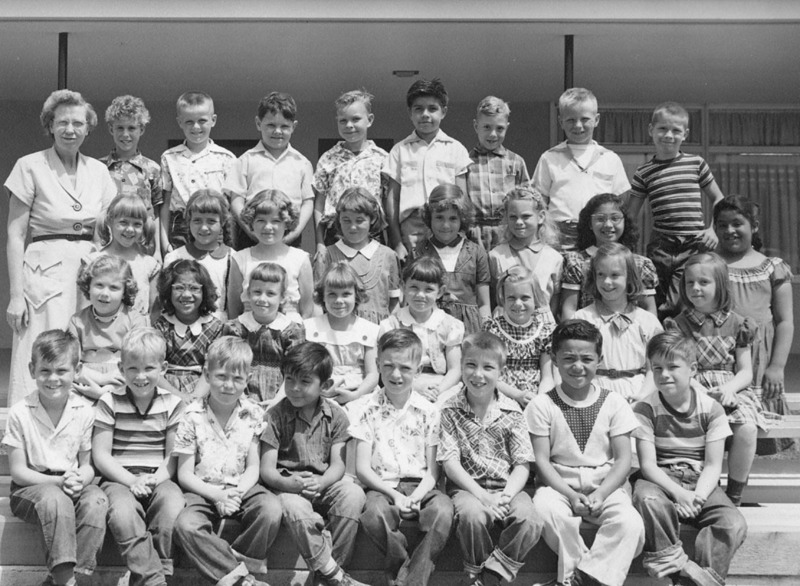 And I am assuming that the person who originally owned these pictures was in the class of 1964 and that, consequently, this is a second grade class. If you can confirm my guess, or you know differently, please write to the webmaster.